"Applying For Government Grants Is A Waste of Time ... Unless You Know How To Get The Money"
Today’s your lucky day because I’m about to save you countless hours of frustration, wasted time, and those “thanks, but no thanks” rejection letters. 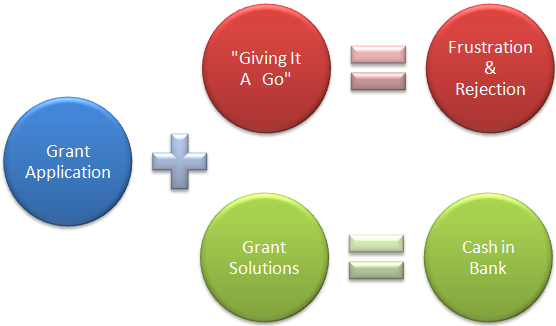 As a director of Grant Solutions, I’ve talked with hundreds of organizations on the topic of getting grants. In most instances these conversations were not pleasant…as the majority of organisations who apply for competitive grants are unsuccessful. For many, it was their first time applying …and some confess that they “had absolutely no idea” what they were getting themselves into. Somehow they heard about the specific grant, worked overtime to put through a submission ...and now… 6 months later they’re telling me about their experience. From the pain in their voice it’s easy to tell that they really needed the money… some were even counting on it. Instead they ended up with nothing. If only they could have read this report (or talked to us) BEFORE going through this "3-step doom process", things might have turned out differently. My 'hidden' agenda and WHY I created this report. Having been running Grant Solutions for over 6 years, I’m SICK of hearing stories from organisations that did not use our services and were unsuccessful in their grant application. I’m sorry, but in most cases it’s too late.. and we can’t help. Instead, I want to work with clients from the beginning and MAKE them successful... so we could get even more client testimonials. Update: Our reputation for success has spread over the last 12 months (we've also been featured on The Age, SMH, SmartCompay, etc) leading to an overwhelming demand for our services. I don’t feel comfortable pitching or trying to 'sell' our services TO prospective clients… rather we like to work WITH them. Yet, everyday Grant Solutions gets phone calls where people ask “why should we use your services?" which i can only interpret as “give us your pitch”. This is not someone who we want to work with... or even talk to. I didn't start Grant Solutions to pitch, I started it to get clients grant money. We're happy to answer any specific questions... but we don't do 'sales pitches'. 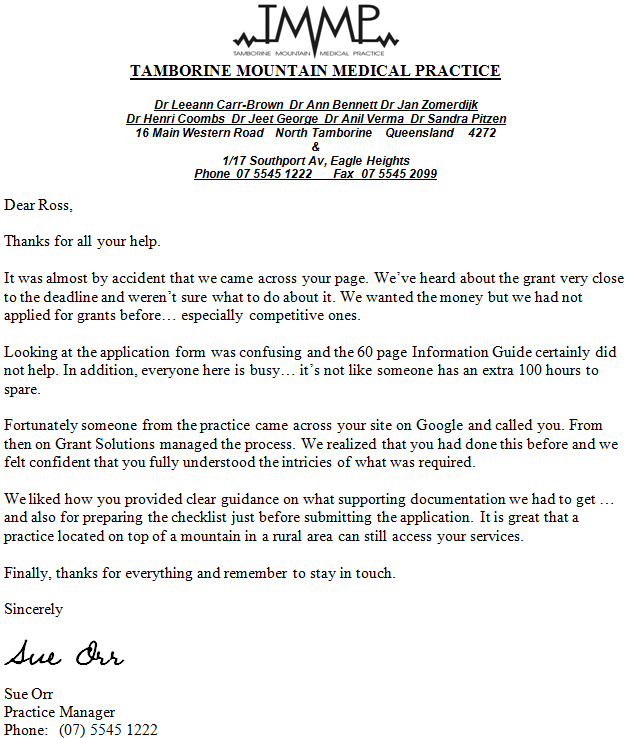 The truth is, in this business we screen our prospective clients… as WE have the most to loose from every transaction. We charge low on-submission fees as our revenue is 90%+ Success Fee based. Each time we sign-up a client, we’re risking approximately 50+ hours of our time because if anything goes wrong, we don’t get paid. Even our Agreement is only 1 page long because trust is very important and we want to make things easier for our clients. Our "hidden agenda" for publishing this report is to allow prospective clients to “self select” or "self exclude" and ONLY contact us if they're a fit. Our services are NOT for everyone… and that’s OK.
Delivering the best outcome is very important to us and that’s why we ONLY want to work with serious and committed clients. That's why we've created the Government Grants Exposed report -- giving prospective clients the opportunity to get familiar with us and how we work. So go ahead, kickback relax … and enjoy this report (as I’m sure you’ll gain a lot from reading it). If you like what you see, then contact us… and become our next success testimonial. Finally, the Government Grants Exposed report is based upon 100+ client interviews – most of whom described their grant experience as “frustrating” at best and “absolutely shocking” in some cases. Grant Solutions acknowledges that this report exposes the "ugly side" of grant applications … but it should open your eyes and save you frustration in the future. Despite the media's emphasis on small business, it is the Medium sized companies that are best positioned to benefit from government grants (such as health, tourism, export, manufacturing). From the government’s point of view, a business which has grown from small to medium is less likely to collapse (and take the government money with it). Grants are generally offered on a matching basis… the business needs to contribute $1 for every $1 of grant money the government is providing (this requirement alone discourages most small businesses from applying -- as they don’t have a matching contribution). Before submitting a grant application, applicants first need to determine if they’re eligible to apply and – most importantly, their likelihood of being successful. Sounds simple ….right? Just call up and ask, you say. Unfortunately it doesn’t quite work like that… not unless you know the right people (which most applicants don’t). When the applicants do call to obtain more information, they’ll typically experience being passed from one person (or department) to another and enjoy a healthy dose of on-hold music. When they finally do get someone on the phone (and can’t be flicked or redirected anymore) that’s when the real “fun” starts. They’re then ready to “handle” the next call… and boy, look at their level of “efficiency”. Indeed, some customer representatives care more about obtaining personal and demographic details (to be proudly featured on minister’s website) rather than assisting you with your project. Declining to provide this personal information (which is not even project related) will lead to arguments and frustration... even though your ability to remain anonymous is a right under the Commonwealth Privacy Act. Good luck winning this one...especially if the person who you're speaking with is not even aware of the Commonwealth Privacy Act (but they are aware of their manager asking for your personal information). Why must you jump through all these hoops? Why not?… collecting personal information for demographic purposes is certainly easier (to quantify and include in a Key Performance Indicators) than answering specific questions (which the person might not even know the answers to). Is it then any wonder that the standard response to any incoming phone call is typically “see our website for more information” ... which accordingly urges you to “call the helpline to speak regarding your specific project”. After insisting that you’ve ALREADY visited the website AND called previously, the person handling your call will probably feel a bit uncomfortable and start reading you the guidelines. But wait a second, you say to yourself… I ALREADY know this… I just want to know HOW it applies to me. Unfortunately, in most cases you’re out of luck…. If you continue to persist then you’ll probably be told to put your request in writing via email (which takes 3-10 business days to get a reply from... that's 2 weeks!). In most cases, this is a barrier because after spending valuable time drafting your query, you’re probably going to get a reply which is a copy & paste from the guidelines (which were unclear in the first place ... and hence the reason you wanted a clarification). If you subsequently follow up, then you’ll need to wait another 3-10 days… (that's a month from your original inquiry) ...and so on. Some applicants are even advised to “just submit application and see”. Anyone who says that… without establishing eligibility and likelihood of success is just telling you to “Get Stuffed”. This response is particularly common around lunch times and after 4.30 pm (especially on a Friday). That’s right a HERD… and what happens to them is irrelevant to the outcome of the funding program. Who cares if they apply or not… the money will be allocated…someone will get it. Things are very different with grant consultants. By the time they call, they’ve read through the guidelines and have specific questions. They’re also likely to know more about the program than the call centre workers … and probably have already established a relationship with the people who will be assessing the grant. Grant consultants can, and do, 'push the envelope' when it comes to obtaining information. When required, Grant consultants will escalate UNTIL they’re clear on the client’s eligibility and chances of success. Tensions peak when questions such as “how many people have previously applied for this grant” are asked. Armed with this information, a grant consultant can dramatically increase the likelihood of the application being successful. After all, they’ve just extracted non-publicly available information from the funding source (even though this information is MEANT to be available to the general public... but falls through the cracks). Knowing this information makes completing grants much easier, placing grant consultants in a FAR better position than anyone else who is also applying for the same funding. Unlike other applicants (who were given the "run-around", didn’t follow up and are now “having a go”) , grant consultants know exactly what to do and can best communicate the project value via the application form. Applications that take months to write (and weeks to refine) are typically assessed in minutes … underlining the importance of getting things right.. the first time. There are no face-to-face interviews or 2nd chances… as the submission is judged purely on the application form. Some applications even clearly state that the "information provided within the application form may be the only thing considered when making a decision"... essentially saying that all other supporting materials (which were Mandatory in the Grant Guidelines - and took the applicant a substantial time to produce) may be heading straight for the bin (hopefully a Visy one) upon arrival or during the shortlisting process. The applicant details section is quite standard and can be easily filled out... but the selection criterion is the most challenging and important part of the application. It will determine if you’re going to get the money or not. Unfortunately the selection criteria stumbles most applicants as some erroneously believe that the government OWES them something… and this is where they get paid. All they need to do is put some “stuff” down and the grant money will hit their bank account. Some applicants even spend the same amount of time on the selection criteria as they spent on the applicant details section. In other cases, answers are copied and pasted from other documents... even if the information clearly looks out of context. If you’re considering doing this, DON”T WASTE your time… just go and watch TV because you’re NOT going to get ANY money. Though the above sounds silly, you can understand why this happens. The person who is applying for the grant tends to be “available” at the time … even though they are probably not the best person for the job. This is one of the challenges many organisations face… employees who don’t care if the organisation gets the grant (as they’ll still be paid regardless). And why should they care? It’s more work for them... and certainly not part of the KPI or the bonus structure. Enter the grant consultants, who specialise in getting grants for clients. Not only are they paid on success but also they have a reputation to protect…. Let’s face it… it’s hard to get future clients without referrals from existing clients… and clients who don’t get grants don’t refer. High achieving grant consultants work on the concept of “Creating Value” and getting a Success Fee for their efforts. This ensures that the consultant is committed to achieving a result, rather than just putting in effort and collecting fees. There may also be a minor upfront fee component to compensate the consultant for their time. The drafting process is very time consuming, requiring perfect grammar in all aspects of the application and for everything to be crystal clear. Remember that you only have one shot at this… and every single thing matters. To produce quality applications, a grant consultant typically review each part at least 5 times and rely heavily on templates which have been developed over time and are proven to be successful. The start dates and end dates must be realistic along the quotes provided. The project must also offer value for money… not padded excessively to pay commissions. Grant consultants bring with them the experience of working in government, giving them an insight into how things work (or don't). Truth be told - most grant consultants hate writing grant applications even more than their clients because only a small percentage of grant applications are successful. It’s also impossible to know how many people will be applying and the quality of their submissions. So consultants are under pressure to work non-stop in order for the application to be successful. What most applicants don’t know is that generally grants are researched, written, and submitted by consultants on behalf of clients. Business owners applying for grants themselves are no longer going up against other applicants. It’s one grant consultant competing against another grant consultant. This means that if you’re not using a consultant, all things considered, you are less likely to get the money. Yes, everyone is encouraged to apply … and (in most cases) they get a polite “thanks but no thanks” letter when the results are announced. "Good on ya for applying, but sorry… someone else got the money... too bad you invested 50+ hours in the application instead of your business… good luck next time (if there ever is a 'next time')". The key to success in the grants business is to make the government an offer which they can't refuse. When in doubt, imagine a politician in parliament trying to defend his department’s decision to fund your project. Is the politician going to look stupid for wasting tax payers’ money? The easier you can make it for the politician to defend why YOU got the money, the more likely that you’ll be the one who actually get it. Use short paragraphs and bullet points… as it’s not an essay. The instant you get a phone call from the funding source, you’re on easy streak… as generally only successful applicants are phoned. Everyone else gets the “thanks but no thanks letter” via snail mail... there is no need to hurry. This is where the game changes. You’re no longer one of many - out in the cold… but part of the few who will shortly get a healthy deposit in your bank account. It means that your application has gone all the way to the top, battled it out with the other submissions and came a winner. It also means that the decision to fund your project was made at the top and it’s going to be very hard to take that money away from you … especially if the successful applicants have been publicly announced. The next step is to sign the agreement and provide the bank account details. Once you’ve executed the agreement, just wait for the cash to hit your bank account. The grant agreement is generally not negotiable (and the officer that you’ll be dealing with probably doesn’t have the power to modify it anyway). So just read, sign and mail it back ASAP because it’s the only hurdle between you and the money. The first grant payment is typically made a few weeks after you sign the agreement, with regular payments scheduled based upon agreed milestones. Progress reports and the final report are pretty simple. Grant consultants are not required for this phase (this is where they’re invoicing big, but well deserved, Success Fees.) Don’t worry about project delays, as time-lines can be negotiated (the government itself doesn’t have a good track record of meeting their own time-lines anyway… in fact expect your payment to be delayed because of a number of unforeseen “issues”). Just be aware that you’re unlikely to get additional funding if you’re over budget… so take that into account when doing your budget and don’t be too optimistic with your estimates. Having said that, you should comply with ALL grant rules and regulations when managing the grant because there will be more funding available in future grant programs. Bottom line is that: successful projects makes EVERYONE look good and help the industry as a whole. At times there may be a temptation to “hand over” the grant submission process to technical people. It may also seem that the more technical information, the submission contains, the better… but this is NOT correct. In one of our projects we requested the 'techies' to complete a 1 page document (a template of which was provided).. instead we received a nicely presented 24 page technical report (which they spent 1 week producing!) ... but not the requested 1 page document. Had this 24 page report been submitted as part of the application, it would have confused the assessment panel and reduced our chances of getting the grant. The thing is... even though projects may be technical, the decision “to fund or not to fund” will be made by BUSINESS people trying to achieve BUSINESS objectives. Sure, they’ll get an OK from the tech guys… but it will be a business decision rather than a technical one. Grant Solutions was created out of the sheer frustration that applicants feel when applying for grants. The people who run this business are seasoned professionals who have experience in submitting competitive grant applications and also have experience within the government. If you would like to get results rather than excuses on your next grant application please Contact Us for a consultation regarding your project.